The Trade Union Movement in Grenada has a relatively brief history. It began with the formation of the Grenada Union of Teachers in 1913 and extended over the years to involve workers in many other areas. The movement had in its leadership people who had tremendous energy and fought to bring about social, economic and political changes in the lives of the Grenadian people. Grenada Union of Teachers was formed in 1913 and was the first union in Grenada. J. S. Allamby became first President on June 20, 1913. To promote teachers' provident and benevolent schemes. The Grenada Association was formed in 1920 under the leadership of T. A. Marryshow. Together with him was Marasse Donavan and George Otway. Men returning from the construction sites of the Panama Canal needed jobs. Under the colonial system top civil servants were the ones making all political decisions - only a few of the propertied classes (mostly colonialists) had the right to vote. Lack of interest by the colonial government led to an attempt to burn down St. George's on January 13, 1920. The response of the government was swift and severe. Among other things, they quickly recruited a large number of special constables to quell the uprising using whatever means necessary. By 1921 the Grenada Association reecognised the failure of the1920 struggle and the workers decided to transform the organisation. 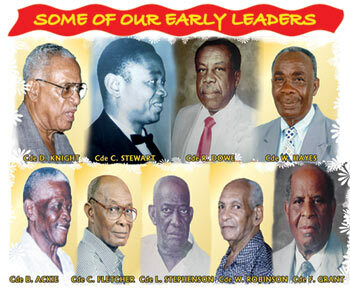 They formed the Grenada Workers I Associa¬tion, (GWA) organising branches in many parishes. The failure of the 1920 struggle through organisational weaknesses. The need to strengthen the organisation by creating a broad base for future struggles. The continued deplorable conditions for workers at that time. Much was done over the next few years to build the Association. Lectures and educational activities were organised for its members. Fund-raising activities were common. A prominent Trinidad Trade Unionist visited Grenada in 1913 and spoke to branches throughout the country. The Government passed a Bill in Parliament in 1931 which led to a massive demonstration in St George IS organised by the GW A. The passage of the Bill resulted in import duties on commodities like tobacco and milk which meant price increases the working class could not afford to pay. The demonstration featured many militant working class songs including, "Toilers of the Nation", "The People's Flag" and "Tempt us not to be disloyal". In the face of this response, the Bill was repealed and in 1932, T A Marryshow and G Edwards were sent to England to make representations on behalf of the working people of Grenada. The impetus the Bill gave to the formation of new unions led to the split of the Grenada Workers I Association. The St John's branch broke away and formed the Grenada Labour Party General Workers Union which was registered in the same year, 1933. It's headquarters was located at Gouyave. Daniel Small and Charles A Grant were both members of the Executive Committee. At about the same time, members of the St George branch formed the Grenada Workers' Union. Its Executive Committee included T. A. Marryshow, Marasse Donavan and George Otway. By 1948 these two newly formed unions had five branches and a combined membership of 1,434. The General Workers' Union had 517 and the Grenada Workers' Union had 917 members. By 1955 the two unions (The General Workers' Union and the Grenada Workers' Union) had formed the GRENADA TRADE UNION COUNCIL. They negotiated jointly with the Grenada Agricultural Employers' Society for workers in the agricultural sector. During this time there was growing concern among workers that the existing unions were not representing them well enough. This was particularly true among the agricultural workers. In 1950 therefore, on the return of Eric Gairy from Aruba, his newly formed Grenada Manual and Mental Workers' Union quickly established branches throughout the Island. There followed some fierce battles for recognition, particularly in the agricultural sector. No settlement emerged on either of these claims, and Gairy called a strike on the estates on January 27, 1951. Many workers responded and La Sagesse and Hope Estates were totally shut down. With no progress by February 19, Gairy called an island wide strike for Agricultural and Road workers. The Government responded by calling in police from neighbouring St Lucia and St Kitts. The British Navy was called in and British troops occupied the island for months after. The strike was settled on March 19, 1951 with the union making major gains in the areas of wages and hours of work . The result of the strike set the scene for major new legislation. The Trade Unions and Trade Disputes Ordinance 33 and the Ordinance of 1948 were repealed. They were replaced by the Trade Union and Trade Disputes Act, 1951. This legislation made it easier for unions to be registered and organised. It also required unions to submit their accounts each year to the Registrar. Other new legislations passed after 1950 included a Wages Council Order, 1951 which regulated wages of workers in the wholesale and retail trades. An attempt to ensure that essential services were not affected by trade disputes led to the Public Health Services Arbitration Ordinance, 1951. The Grenada Seamen and Waterfront Workers' Union (SWWU), an off-shoot of the Grenada Workers' Union severed its branch membership with that union in May 1952. The main personality behind this section was G B W Otway, a member of the Grenada Working Man' s Association since 1928. The SWWU was registered on the July 22 1953 and represented stevedores and longshoremen. In 1957 membership was extended to the lightermen and in that year employment on the waterfront was closed to non-union members. By 1958, the SWWU had become the most organised, cohesive and industrious trade union in the country. In 1952 the Society of Agricultural Labourers was registered. The Taxi and Motor Drivers' Union was registered in July 1955, followed by the Taxi Owners' and Drivers' Association in the same year. The Commercial and Industrial Workers I Union broke from the Grenada Workers' Union and was registered on December 12, 1956. Eric Pierre was the President. The Technical and Allied Workers' Union was registered in 1958 under its President Derek Knight. The Grenada Civil Service Association was registered in 1951 with D M B Cromwell as its President. The Grenada Employers' Federation in 1962. The Grenada Union of Teachers in 1960. The Progressive Labour and General Workers' Union in 1967. The Grenada Farmers' Union in 1968. The Bank and General Workers' Union in 1977. The period up to 1968 was a time for organisation and registration for unions in Grenada. On the industrial front, things were relatively quiet. Up to March 1979 Trade Unions had to be recognised b employers in order to be the legal bargaining agents for workers. With no law to govern the status of recognition, the activities of trade unions were severely restricted and their membership stagnated. The Essential Services Act, 1964 which made it illegal for workers in the Electricity, Central Water Commission and Telephone Company to take strike action. The Essential Services Amendment Act, 1968 which extended the 1964 Act and took away the right to strike from many more workers. The Newspaper Amendment Act, 1978 which required a large sum of money to be put up before anyone could issue any kind of newspaper (including a union news sheet). The Public Order Amendment Act, 1975 which required organisations to get permission before using public address equipment at meetings. Factories (Sanitation Accommodation) Regulation, 1967 which required the provision of toilets in certain workplaces. Protection of Wages Act, 1973 which prevented employers from Making unnecessary deductions from workers' wages. Workmen Compensation, 1958 which provided limited compensation to workers injured in the course of their employment. Maternity Leave Law, Peoples Law No 53, 1980 which allowed working women three months maternity leave (in part with pay). Trade Union Recognition Act, Peoples Law No 29, 1979 which provided for the compulsory recognition by employers of trade unions which represent a majority of workers. Trade Union Recognition Amendment Law, Peoples Law No 1, 1982 which required non-members to pay a compulsory service contribution (Agency Fee) to the Union. Workmen I s Compensation Amendment, 1982 which improved the benefits of the 1958 Act.